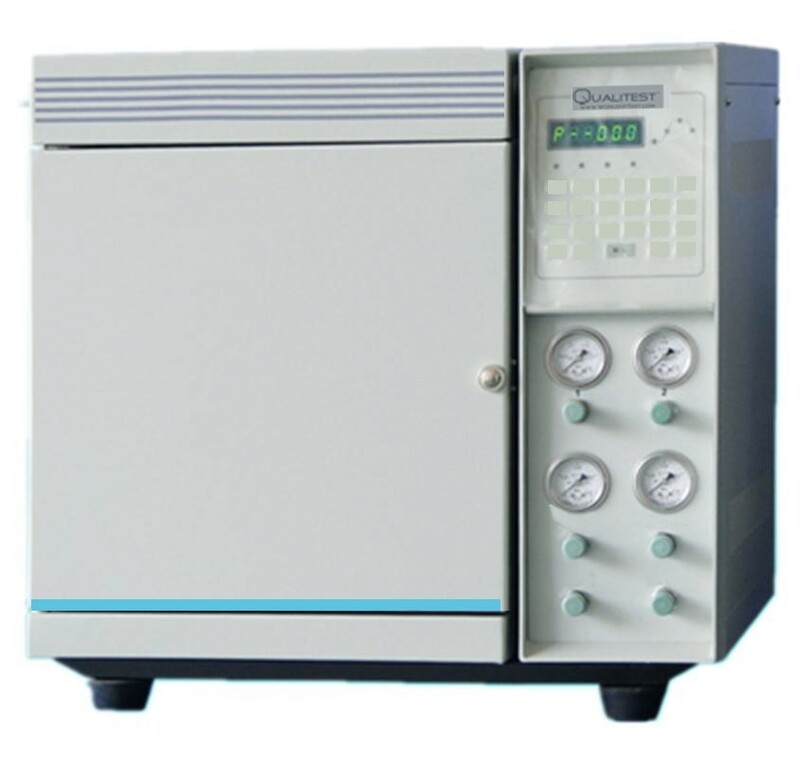 QT-GCH-9800 Gas Chromatography Tester is designed to separate organic solvents. It is able to test solvent residues of printed packaging material, or the purity of a single solvent. Four-way microcomputer temperature controller with digital display. Two set of commonly used detectors are optional at the same time. Temperature can be maintained close to room temperature (room temperature +10°C). Oven column with large capacity has auto opening door in the back. Machine can perform three-period program heating. Optional configurations: packed column sample injector, capillary column sample injector, gas sample injector etc. With self-diagnosis function, fault location and fault nature can be displayed at any time. Over temperature protection. When temperature (any way of the four ways) exceeds the set value, the heating will stop automatically. Carrier gas from the gas cylinder (or the gas generator) flows out through the pressure reducer . After the disposal of gas purifier, removing moisture and oxygen, it flows into the instrument from the carrier gas entrance joint and passes through stabilizing pressure valve, needle valve (or steady flow valve) and manometer . Finally, it flows into the vaporizer at a constant flow rate. Of course, liquid sample will be vaporized to gas sample after being injected into vaporizer with micro injector. Later, it will be separated through the chromatographic column. When using TCD, carrier gas with the separated fractional compositions enters into TCD one after another. Due to the different thermal conductivity coefficient between carrier gas and the compositions, original thermal balance of tungsten-rhenium component in the TDC is destroyed. Accordingly, bridge circuit generates the corresponding electric signals, which is direct proportional to componential concentration, and recorded by recording meter, chromatographic data processor or chromatographic working station. When using FID, the analyzed compositions are brought into ion chamber by carrier gas one by one. Under the help of Air, those compositions will meet the hydrogen gas at the quartz nozzle entrance and will combust while flowing out of the nozzle. If organic compositions containing C and H element burn in the hydrogen flame, the C and H will be ionized to positive ion and electron, thus weak ion current will be produced because of high-voltage between the two poles in nozzle. The voltage signals can be taken out from a high resistance (107-1010Ω). After amplified, the recording meter will record it, and then we can make qualitative and quantitative analysis. Gas sample can flow into gas circuit through flat six-way valve. To macromolecule material sample, cracking injection way can be used.